In the 1930s, recipes for banana bread began to appear in American cookbooks. Some culinary historians cite the availability of baking soda and baking powder as the impetus for this treat, while others believe it came simply from the kitchen of an enterprising and thrifty gal who didn’t want her overripe and hard-earned bananas to go to waste. I’d wager that both are the truth, and being a thrifty baker myself, applaud the woman who mashed up her spotty bananas and whipped up the first heavenly-scented loaf of banana bread. 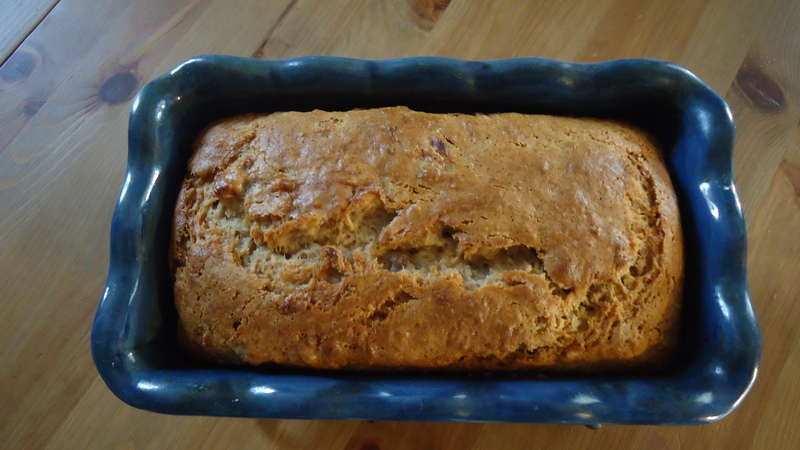 Banana bread is simple, and very easy to make. Being a quick bread, there is no yeast, kneading, or rising time involved; the whole process, from mixing bowl to table, takes about an hour. Banana bread can be served warm but many bakers, myself included, believe that it tastes better after a day or so, when the flavors have had time to settle. Grease an 8x4x2 loaf pan and set aside. In a medium bowl, combine flour, baking powder, baking soda, and cinnamon. Make a well in the center and set aside. In another medium bowl, combine egg, mashed bananas, sugar, and vegetable oil. Pour into flour mixture and stir until combined. Pour into loaf pan and bake for about 50 minutes, until a cake tester comes out clean; check the bread at about 40 minutes to make sure the top isn’t browning too quickly; if it is, make a tent of aluminum foil and cover the bread until it is through baking. Cool completely in the plan. I love banana bread! it is probably the first thing I really mastered to make on my own. I made it often in grad school and always brought it to art openings. I find the large loaf can stay gooey, so I usually bake two smaller loaves and I never have to worry about raw-ness in the center. I have tried variations- with chocolate chips or peanut butter, but I like regular ol’ banana bread the best. Just the perfect thing in the morning with a cup of tea. ooh, i haven’t tried it with peanut butter but i bet that would be delicious…even more so with some chocolate chips, too. perhaps i shall whip up a peanut butter banana bread sometime soon. I throw my overripe bananas (still in their peels) into the freezer in a ziplock bag. When I want to bake with them, I thaw them and strip off the grossness that becomes the peels. But they are super easy to mash at that point. Because, you know, the mashing of them without freezing was really straining my biceps… This might just be a tip for people too lazy to mash stuff. nice! how long do you keep them in the freezer? are we talking weeks or months? i’ve heard about doing this before but i’ve never frozen my overripe bananas and that seems like a really good solution. Weeks or months…. ?…depends on whether I remember they are in the freezer waiting for me. Usually I am looking for something else in the freezer and stumble upon the bag of black bananas. I’m thawing some in the sink right now to bake up as a thank you for V and Elena. My recipe is almost exactly the same as yours but adds a 1/4 tsp of ground nutmeg.